I’ve been chipping away at it, 15 minutes here, an hour there… It’s amazing how much progress you can make after a few weeks of piecemealing it. Would I prefer a large chunk of time—say, an afternoon? Sure. But I’ll take what I can get, and at the moment, the car is very close to being ready to go to paint. 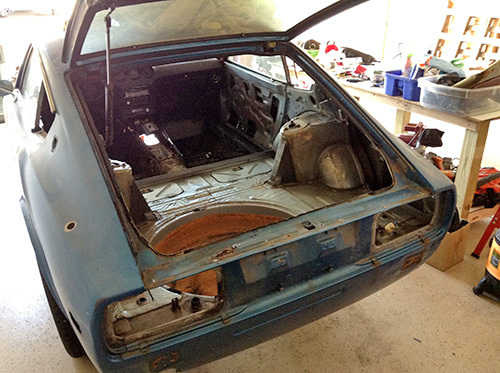 Starting at the rear, I removed the fuel tank and all the hatch trim. The taillights, finishing panel and rear bumper came off. The rub strips, which I loathe, were very difficult to pry off, and the body guy is going to have some restorative work to do to smooth out the holes and dimples their removal left behind. The scary-looking rust in the spare wheel well isn’t structural, fortunately. All the red vinyl diamond-pattern upholstery came off too. 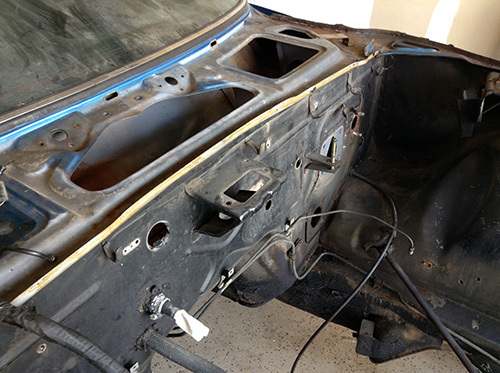 I fished the rear wiring harness around the right rear wheel well and removed the quarterlights. 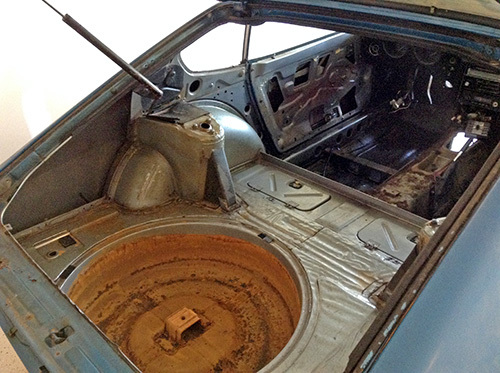 It’s been interesting to see what the painters chose to remove and what they left in during the 240Z’s blue repaint back in the 1970s. Some things I’d have thought would have been tough to pull were left in, and other bits were painstakingly removed. Regardless, the car’s all going back to its original 901 Silver. Very encouraged by the progress. Next up is the dash itself, the final removal of the wiring harness, the heater core and then the rear-end mechanical bits like the diff and brake lines. Onward! 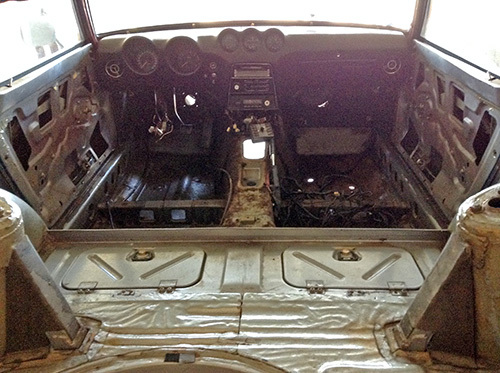 Update: Since drafting this post, I’ve removed the dash. More on that in the next installment. Just discovered this saga while looking for a windshield wiper motor. Original owner of an orange 72Z, with 110K miles. Have done all my own work over the years. A few minor mods, original paint, runs fantastically well. Will be watching every now and then. Keep after it! Wow. Am considering a seriously degraded ’73 Z for a long term project. This is invaluable info, thank you. It’s daunting, no thank you. It’s humbling and terrifying, really no thank you. Thanks Steve. The project is still active… Waiting for my dad to come pick it up from my garage so he can take it back to NC for the body restoration. Stay tuned. soaking the cylinders hasn’t worked and I don’t wont to cause any damage. It ran great when I parked it. Looking forward to more progress reports from you. Otherwise, the project is on hold until my dad comes from NC and picks up the car to have the body restored while I scrub down the engine and trans. What are you using to unstick the cylinders? Marvel Mystery Oil works wonders, from what I’ve heard.